Strictly for the Boys: Amy thought she was marrying for life, until Burt turned out to be less of a man and more of a monster. Running to her mother, who's on Burt's side, Amy gets her divorce but can't escape her ex-husband, who refuses to acknowledge the divorce and indeed, any challenge to his claims on Amy. She needs help desperately but Burt is very, very dangerous, especially when cornered. Three little known gems from Harry Whittingon, "King of the Paperbacks," shipping in two weeks. ANY WOMAN HE WANTED: Mike Ballard works homicide, busted down from lieutenant four years ago for accepting bribes. He had ripped things wide open then, turning on the fat cats whom he had been protecting. But nothing had really changed. Guys were still working the rackets, and shop owners were still getting killed if they didn't pay. DA Tom Flynn tries to enlist Ballard in his own fight against corruption--and dies mysteriously in a car accident the next day. And then there's Lupe, pregnant by the son of one of the most influential men in town, who wants Ballard's help and isn't shy about how she goes about asking. And Naomi, who knows just what she wants. There's only so much a man can take. When they push him too far, Ballard only has one recourse--cop or not, he comes out swinging. As I write this, the Tofurkey is in the oven, actual wild turkeys are in the front yard, and snow has been falling all morning. Merry Christmas, Happy Hanukkah, or any other holiday you and your family are celebrating! January is bringing with it the release of our next Harry Whittington book, a trio of some of his most unusual, perhaps overlooked books. To quote our resident Whittington scholar, David Laurence Wilson, "For the first time in fifty years and two or three generations of readers, this Stark House collection is reprinting Whittington novels without explicit murders, without a lot of gun play, or poisonings or even lethal pushes down stairs." From his introduction "The Restoration of Harry," he adds that "These lesser-known Whittington novels feature conflict and pain but no murders" but all the same they are typically intensely readable and compelling Whittington. Would you expect something less from the man who later in life wrote historical romances as "Ashley Carter"? 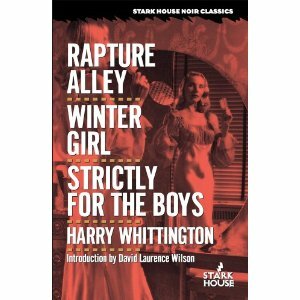 The books themselves, Rapture Alley, Winter Girl, and Strictly for the Boys, offer different facets of Whittington's period writing. Rapture Alley is a complicated relationship tale that becomes his evil-of-drugs-come-to-redemption story so often done as a "juvie" book. Winter Girl may be one of Harry's best stories, with small town intrigue and prejudice taking the place of a genre mystery story. It is a book of the south, and couldn't happen any place else. Part coming of age story, part tale of unattainable love, part tale of the Cracker south of central Florida, Whittington's trademark suspense permeates the story. The third book, Strictly for the Boys, is another tale of obsession, yet of a far more domestic and chilling kind. It predates Joyce Carol Oates' classic short story "Where Are You Going, Where Have You Been?" but mines the same territory of everyday horror: What do you do when someone won't let you go? When they'll do anything to keep you or get you back? And I mean anything. Another exciting piece of news is that we're working on several previously unannounced projects, one of which we hope to ship in February: a two-in-one volume of Elliott Chaze's classic Black Wings Has My Angel, one of the all-time classics of the genre. We're pairing it with Bruce Elliott's One is a Lonely Number, a title that reflects the noirish nature of the book in more ways than one. With brand new introductions by Ed Gorman and Bill Crider, we're excited to add this project to our list, a great noir pairing by two masters of the genre. Elliott Chaze (1915-1990) penned one of the definitive Gold Medal noirs of all time with Black Wings, his third book, while working as a journalist and fiction writer. Bruce Elliott (1917-1973) was a professional stage magician as well as a prolific writer. Author of several works on magic, he also wrote a number of Shadow novels, many of which are somewhat controversial as to his unusual handling of the Shadow and his alter egos. As a title, One is a Lonely Number sums up the sort of noir atmosphere he writes of in his book, the story of a dying escaped prisoner trying to extend his life in more ways than one. And as always, if you're not a member of our Crime Book Club, sign up now to get each book shipped to you automatically and take advantage of the special discount for new members to fill out your collection of back list titles.